I hope everyone has a wonderful Thanksgiving! Sorry about the lack of recipes lately but I’m still in the states enjoying time with my family. I’ll be back in my own kitchen by the beginning of December so keep checking back. If you still have a can of pumpkin left in your pantry, try making this delicious Pumpkin Roll. 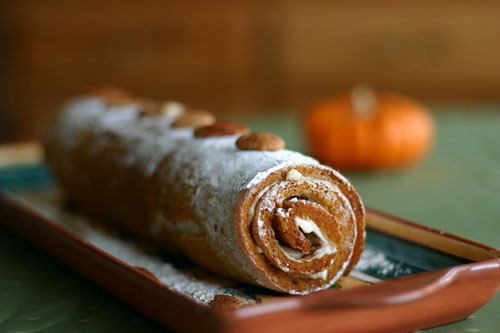 It’s basically a pumpkin sponge cake rolled up with sweetened cream cheese. The one in the photo was made by my friend Ruby and has some chopped pecans mixed in with the filling, which is an optional but recommended addition. There are tons of pumpkin roll recipes out there but Ruby recommends the basic Libby’s Pumpkin Roll recipe. 1. Preheat oven to 375°F. Grease a 15x10 jelly roll pan (also known as half sheet pan); line with parchment or waxed paper. Grease and flour paper; set aside. Spread out a clean, thin dish towel on the counter (make sure the towel is larger than your jelly roll pan); sprinkle liberally with powdered sugar (this can be done using a mesh strainer). 2. In a small bowl, whisk together flour, baking powder, baking soda, cinnamon and cloves. 3. In a large bowl combine eggs and sugar; beat until thickened. Add pumpkin; beat until well mixed. 8. When cake has cooled completely, unroll, spread with the cream cheese filling then re-roll cake. Wrap rolled cake in plastic wrap then refrigerate at least one hour (overnight is best). Happy Thanksgiving, Nicole! the pumpkin roll looks amazing! Nicole, enjoy your holiday with your family. Thanks for thinking of me. Happy Thanksgiving! That does look good! Yum! Happy Thanksgiving! Happy Thanksgiving, Nicole! I've missed you! that looks amazing, I love it (!) might be even better than pumpkin pie...;) happy thanksgiving! Happy Thanksgiving. Good times with good family is good to hear. I make this recipe quite often. It is yummy. I am a greedy heffer!!! That looks totally yummy! I can almost smell it all the way from Saskatchewan. Sounds delicious and the photo is fantastic! Bravo!Who makes the plate your pumpkin roll is sitting on? I hope you had a warm and wonderful Thanksgiving! I know you returned to the US under sad circumstances, but I'm happy for you that you're getting to spend so much time with your loved ones.This looks terrific--but I'm a sucker for anything pumpkin flavored. Nicole, I hope you're having a wondeful time!Beautiful photo - and yummy recipe! Your photos improve with each post I think. Any secret? I have a question not concerning food. I'm left the US to move to Switzerland, giving up the plan of getting a masters in Educ. I noticed on your profile that you are doing distance learning. would you mind if we chatted via email one time about that experience...how you chose school/find the program etc? Yum, what a lovely lovely looking-roll! Happy holidays to you! Can't wait for you to be back! Glad you had a good time! Enjoy the holiday season! Oh my word. I've piled on the pounds just looking at that mouth-watering treat. Pumpkin and chocolate - my two favs. Oh wow... that looks incredible! that's a wonderful crafted pumpkin roll! i just discovered your blog from your entry to DMBLGIT Nov 2006. hope you'll be the winner! WOW! My rolls never come out that perfect!!! What's your secret? wow you are great !!!! Just found your website and really like it. I have made the Libby's pumpkin roll recipe for the last 2-3 years. But this is (sort of) a seasonal thing, so I made some substitutions that have been well received. First, I substitute drained, sweetened strawberries for the pumpkin. 2/3 Cup is fine, but be sure to drain them or the cake is a bit mushy. Second, I use strawberry cream cheese. Often, I also add strawberries to the cream cheese as well. Another difference I occasionally utilize is that I add pecans to the strawberry/strawberry cream cheese mixture, not just with the cake. Ooooh, that looks fabulous! I just love your presentation. I never think to do a rolled cake. I love it! This is sooo gorgeous! It looks quite tasty too! wow, i tried this today and it was absolutely delicious! i'm definitely adding this to my recipe book! Pumpkin roll is part of our Thanksgiving tradition & has been since I first tried the recipe. I made it for our office Thanksgiving meal and had many requests for the recipe. One lady said her daughter now asks for this instead of a birthday cake each year! Yours looks lovely! I have made this pumpkin roll for years and it is an excellent recipe and so easy. Sometimes I sprinkle finely chopped walnuts on the cake layer before I bake it or over the frosting after I have spread it on the cake . It makes for a little different taste and my family likes the change sometimes. is this good. i hope it is. im making it for thanksgiving. yikes. I've had this recipe tagged for a couple of years, and today was its day! It was simple and my cake rolled beautifully! I was really afraid about all of the rolling and unrolling, but it was a total success. My changes were: adding 1 tsp of lemon juice to the batter and only 4 T of butter and 3/4 cup of powdered sugar in the frosting. Thank you! It turned out delicious! Thanks! I love all these recipes, they are so good! I don't know how many times I tried "Roll Cake" but turned out "tri-folded cake". It always breaks while I am trying to roll it. But I think I should give it a try for this recipe because the sponge is kind of thin...plus I love pumpkin! I love this pumpkin roll!! i have made it so many times i know the ingredients without looking at the recipe! I have it memorized now lol i just made 4 of the rolls yesterday and everyone wanted the recipe ! Thank you so much for this wonderful recipe and i also make the banana rolls great way to use up those overripe bananas people sp yummy! HAVE A GREAAAT HOLIDAY! Def. enjoy your FAMILY!!! Glad to see you posting again!